Mechanical testing is used to determine properties such as hardness, modulus, fracture toughness or yield strength. Uniaxial compression and tensile testing are typically used to examine bulk samples to acquire elastic modulus data. Hardness test methods use an indenter probe that is displaced into a surface under a specific load. In traditional testing, the size or depth of indentation is measured to determine hardness. Microhardness testing is an industry standard for quality and process control for hardness data. Microhardness testing, with applied loads under 10 N, is typically used for smaller samples, thin specimens, plated surfaces or coatings. Nanoindentation has advantages over traditional mechanical testing, providing both elastic modulus and hardness data. Integrated indentation testing (IIT) automates the indentation process so hundreds of tests can be performed on a small sample size. Some material composites and devices are too complex to apply traditional test methods. As dimensions shrink, mechanical properties change as the scale changes from bulk to micron to the nanometer. And a nanoindenter is often more accommodating with respect to sample geometry. The factors involved in mechanical testing are load, displacement, area and time. Load (P) is the force exerted on the sample. Displacement (h) is the distance the indenter travels into a material. Area (A) is a measure of the interaction of the indenter in contact with the sample. Schematic of an indentation test. 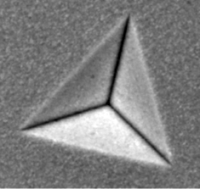 Nanoindentation is typically conducted with a calibrated Berkovic diamond indenter tip. A Berkovich tip is a three-sided pyramidal indenter. The three sides allow the tip to be theoretically sharpened to an atomic point. During the nanoindentation process, a calibrated indenter tip approaches the surface of the sample. The force-displacement data is used to determine the point of contact. After the sample is contacted, the force is linearly increased and the tip indents into the surface of the sample. A short dwell time occurs at the maximum force and then the sample is unloaded. At the initial point of unloading, the stiffness is measured. The resulting load and displacement data along with the area from the calibrated indenter tip allow for the determination of mechanical properties such as elastic modulus and hardness. One of the most common mechanical test methods is the tensile test. The tensile test increases a tensile load in one direction, usually until a fracture occurs. 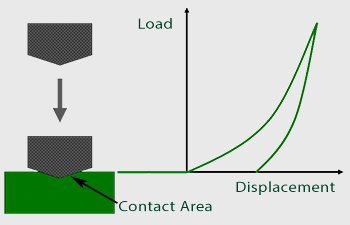 The load can be applied in tension, compression or shear. Schematic of a tensile test sample. 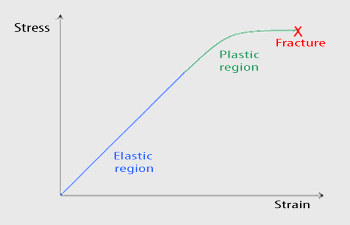 The resulting stress-strain curve is used to determine mechanical properties like elastic modulus, yield strength ,and fracture toughness. A traditional hardness test measures a material’s resistance to localized plastic deformation. Hardness tests are the most common mechanical test and typically are non-destructive for bulk materials. As dimensions shrink, the residual impression from a hardness test may alter the material properties. Standard microhardness testing is available for small or thin samples. Universal Testing Machine T150: Universal Testing Machine that provides dynamic characterization of mechanical properties for new product development and research.